A.G. Macdonell wrote mystery novels under the pseudonym Neil Gordon. Neil Gordon is one of two pseudonyms used by Archibald Gordon Macdonell when he was writing detective and thriller fiction. Macdonell began his writing career as a journalist, writing mostly theater reviews for London Mercury. In 1933 his novel England, Their England received the James Tait Black Memorial Prize, and it is this book for which he is most likely best remembered. Another satirical novel The Autobiography of a Cad (1938) has garnered something of a cult reputation lately. In addition to novels and a handful of plays he wrote at least one book on military history. As "Neil Gordon" he wrote five detective novels, one mystery novel was done in collaboration with Milward Kennedy, one of the founders of the Detection Club, and he wrote two other detective novels under the pen name John Cameron. 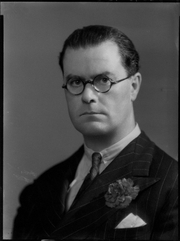 In 1941 Macdonell died unexpectedly at the age of only 45 in Oxford. A. G. Macdonell is currently considered a "single author." If one or more works are by a distinct, homonymous authors, go ahead and split the author. A. G. Macdonell is composed of 5 names. You can examine and separate out names.